It’s that wonderful time of year! Yes, the holidays are upon us and with that comes the hustle and bustle of shopping, wrapping, decorating and entertaining. Just as the holiday season can be a source of joy, it can also be a time of stress and anxiety for everyone including our pets. So, when you are making your list and checking it twice, you may want to add one more to-do item – a reminder to keep your pets safe and healthy during the season of celebrating. Holiday foods, Christmas trees, presents, decorations, and visitors all have the potential to dampen your pet’s holiday spirits. If running to the vet during the holidays because the dog ate a box of chocolate or the cat ingested a ribbon is not your idea of holiday fun, you can rest assured it’s not your pet’s idea of a good time either. While festivities abound, sticking as closely as possible to your pet’s normal routine will help to keep your pet happy and relaxed. Staying on the same feeding, walking, playtime and rest schedules helps to reduce the confusion of festivities or relieve the stress of a houseful of unfamiliar guests. Not all guests are comfortable around dogs and vice versa, so be sure to provide a safe, quiet and comfortable space where your pet can be confined when necessary. If you choose to let your pet join in the festivities, be aware that pets may need an occasional break from noise or attention. If you have small guests and your pet is not used to their attention, keep a watchful eye for signs of stress and isolate your pet to avoid overstimulation. Be aware that as people come and go during a party or celebration, it’s the perfect opportunity for pets to escape. Be sure they have ID tags on at all times and perhaps consider making one person responsible for their whereabouts during festivities. While it may be tempting to give your pets leftovers from the holiday table, keep in mind that some foods can cause gastric upset or may be toxic to your pet. Chocolate, onions, grapes, raisins, rich fatty foods, macadamia nuts, alcohol and other foods can sicken or require hospitalization for pets who ingest them. Make sure guests know your rules and keep pet treats or kibble handy for those who can’t resist giving a nibble to the little beggars waiting patiently nearby. Clear plates and glasses from low tables where pets can quickly gobble up food that’s remaining. You may not notice but they will be hyper aware of where any available food may be. Excitement and anxiety can lead to thirst, so be sure your pets have plenty of clean water at all times. Keep certain holiday plants, such as mistletoe, holly, amaryllis, and to a lesser extent poinsettias, high and out of reach of pets. When ingested, they may all cause serious and in some cases potentially fatal health issues. Lilies can cause kidney damage in cats, so keep these away from curious kitties or don’t bring them inside at all. Pine needles are also potentially dangerous if eaten, so clean fallen needles regularly. Cats love to climb in Christmas trees and a large dog can easily knock over a tree, so be sure it is securely anchored. Keep ornaments off low lying branches if you have a curious cat that likes to play. Food based garlands are tempting, so reconsider decorating with popcorn or cranberry strands in order to keep your tree upright and your pets safe. You may want to skip the candy canes as well. Breakable glass ornaments can present a danger to pets. Round, shiny ball shaped ornaments can be mistaken for toys and if broken, shards can become imbedded in your pet’s paws, mouth or esophagus. Bubble lights are pretty but they contain methylene chloride. Exposure to this chemical can irritate pet’s eyes, skin, lungs and GI tract. Prevent access to the water in the tree stand by covering it with a tree skirt or use other means to keep pets from drinking the water. Keep electrical cords well hidden, wrapped or in cord containers and make sure they are out of reach for pets who may be tempted to chew on them. Lit candles can present a hazard if left on low lying tables where they could easily be knocked over. Pets may find seasonal scented candles tempting for their smell, taste and texture. You may know it’s not apple pie but your pet will not. Keep candles up high and out of reach of pets. 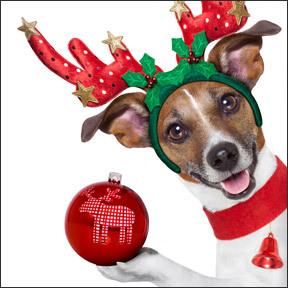 Your pets will be able to smell any wrapped food gifts left under the tree or in stockings. Be sure these gifts are placed out of reach of pets unless you want to find an empty box or a sick pet on Christmas morning. Wrappings that include ribbons, yarns, bows or strings present choking or intestinal obstruction hazards to pets. You may want to stick with paper only wrappings and avoid these tempting and potentially dangerous items. Be careful of holiday gifts even if they are made especially for pets. When swallowed, small objects or parts can present choking or obstruction hazards. Choose wisely as toxic chemical residues, preservatives or dyes can also be present. Avoid toys with strong odors, bright colors, flame retardants or stain guard. Buy toys that are suitable to your pet’s age, development and personality. While many may wish to give or receive a puppy or kitten, the holidays are not a good time to bring new pets into the home. New pets will require training and establishing a routine is difficult enough without the commotion of the holidays. Good intentions aside, while pets bring love and companionship, they also bring responsibility and a long-term commitment. Consider waiting until after the holidays and get your new pet when decorations are stored and life is back to its normal routine. Giving a gift certificate for a shelter pet, bedding, food or supplies rather than an actual pet allows recipients to choose the right time to make this important decision. Pet adoption is much more successful when you find the right match for yourself or your family and can give your pet the time, love and attention your new furry family member undoubtedly deserves. This entry was posted in Home and tagged Holiday Tips for Pet Owners, pets, Professional Supplement Center, Vitamins and supplements, www.professionalsupplementcenter.com. Bookmark the permalink.